Courtyards Senior Living in Knoxville fulfilled a last Christmas gift wish for one of their residents, Frank Doris, who is on hospice. Frank has spent a career devoted to truck driving for over 20 years. He was accompanied always by his faithful companion, his dog “Lil Bit.” He has also served proudly with the United States Marines until being discharged as a disabled veteran after being shot five times in the Vietnam War. Frank chose Courtyards as his home when he became ill, and, now towards the end of life, Frank’s last wishes were to return from the hospital to his Courtyards apartment that he identifies with as home and to spend his last days among those he is closest to there, including Lil Bit. Larry Jameson with the Loudon County Trucking Company agreed to partner with Courtyards to make a special surprise a reality for Frank. 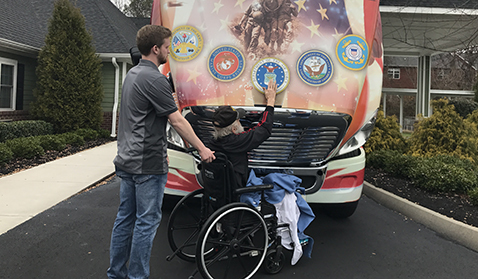 Loudon County Trucking Company is a trucking company that offers a veteran-themed wrapped Wounded Warrior truck that appears often in parades and other public venues for vets. On the Friday before Christmas, Frank was presented with a portrait of the company’s truckers posed with the truck that includes their signatures with a Marine medallion. He also received the Trucking Company hat in appreciation for his faithful employment as a trucker and his service to his country.